On the right side of the soldier's body was a short and relatively lightweight instrument that was his main fighting weapon. The sword, or gladius, was short and thinner than might be expected. When first examining the gladius, it is difficult to see how such a small weapon, just 18 inches long, was capable of being so effective. But as we shall see the gladius was ingenious in design and implementation. The soldier wore his gladius on the right side of his body regardless of whether he was left or right handed. As soldiers fought battles not individually, but as a single unit, standing shoulder to shoulder. There would be up to 500 men in a line all touching the one either side, so making it impossible for the enemy top get through the ranks. It was imperative that they all used the same hand for fighting with the gladius. So in training, any left handed soldiers would have their left arm strapped to their body and made to practice using his sword with his right hand until it was second nature. When using the gladius, the legionaries did not hack at the opponent as this would have made the soldier vulnerable to attack on the exposed parts of his body. Instead he was trained to stab at the enemy in a very fast back and forth motion. This was most effective as it meant a much faster rate of attack, probably as much as four stabs per second, as opposed to the one slice every two seconds if the gladius was used in a swinging motion. Wearing it on the right side meant the legionaries could draw his gladius in a very compact manner without interfering with the soldiers on either side of him. Considering the close formation of the Roman battle unit this was a distinct advantage. Having the gladius on the right side meant that it could be drawn without the risk it could be caught up in his shield (Scutum). *Note: There is more information on gladii at the bottom of this page... clicketh thee here. Though it could be used in single combat and self-defense, the gladius was adopted by the Romans mainly because it was an effective weapon for organized combat. 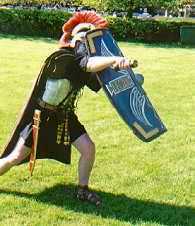 The legionaries generally carried a large, heavy shield, a pilum (javelin), and sometimes plumbata (basically large lawn darts) along with their gladius. The relatively light weight of the sword made carrying all this gear on the battlefield possible for the average soldier. The Roman formation consisted of three rows of legionaries each with about three feet (or one meter) of space per man. Each row was separated by about six feet (or two meters). When closing with the enemy thepila and darts would be launched to breakdown the opposing formation. The gladius was then drawn and the enemy would be engaged with it. The gladius was thrust between shields and an attempt was made to hit the torso of the enemy. The sword could also be employed with a hacking motion going as far as hacking off limbs. Soldiers were even trained to slice at an opponent's legs beneath his shield if this offered the only opening. Stabbing was a very efficient technique, as stabbing wounds, especially in the abdominal area, were almost always deadly. However, the gladius in some circumstances was used for cutting or slashing, as is indicated by Livy's account of the Macedonian Wars, wherein the Macedonian soldiers were horrified to see dismembered bodies. Livy relates the story of Titus Manlius Torquatus accepting a challenge to a single combat by a large Gallic soldier at a bridge over the Anio river, where the Gauls and the Romans were encamped on opposite sides of the river. Manlius strapped on the Hispanic sword (gladius Hispanus). During the combat he thrust twice with it under the shield of the Gaul, dealing fatal blows to the abdomen. He then removed the Gaul's torc and placed it around his own neck, hence the name, torquatus. The combat occurred during the consulships of C. Sulpicius Peticus and C. Licinius Stolo — i.e., about 361 BC, long before the Punic Wars, but during the frontier wars with the Gauls (366-341 BC). One theory proposes the borrowing of the word gladius from *kladi- during this period, relying on the principle that k often became g in Latin. Ennius attests the word. Gladius may have replaced ensis, which in the literary periods was used mainly by poets. The exact origin of the gladius Hispanus is disputed. While it is likely that it descended ultimately from Celtic swords of the La Tene and Hallstat periods, no one knows if it descended directly from Celtiberian troops of the Punic Wars, or through Gallic troops of the Gallic Wars. Arguments for the Celtiberian source of the weapon have been reinforced in recent decades by discovery of early Roman gladii that seem to highlight that they were copies of Celtiberian models. The weapon developed in Iberia after La Tène I models, which were adapted to traditional Celtiberian techniques during the late 4th and early 3rd centuries BC. These weapons are quite original in their design, so that they cannot be confused with Gallic types. While often thought to be steel, that material was not really understood at this time. The word was used, yes, but basically swords at this time were made of what we call "wrought iron." Gladii were not really hardened. Some (few) examples have been found to have some rudementery hardeining, but nothing like what we think of it and certainly not "pattern-welded" (Damascus) steel with layers of differing types and hardnesses of steel welded together in a forge — that technique was from a time after the Emprie. 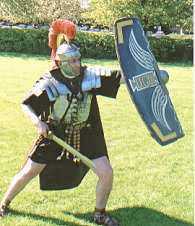 Several different designs were used; among collectors and historical reenactors, the three primary kinds are known as the Mainz gladius, the Fulham gladius, and the Pompeii gladius (these names refer to where or how the canonical example was found). More recent archaeological finds have uncovered an earlier version, the gladius Hispaniensis. Several sub-categories of the gladius have been catalogued. They are named for the area in which they were first discovered. The Mainz gladius was slightly shorter than the Hispaniensis. It was also lighter and had a less pronounced leaf shape. It would have come into its own during the Early Roman Empire. The Fulham gladius loses the leaf shape. Its parallel edges meet a triangular pointed end. Shorter yet was the Pompeii gladius which only reached from about 50 to 55 centimeters. The disadvantage in length was made up for by its ease of carriage. The differences between these varieties are subtle. The original Hispanic sword, which was used during the republic, had a slight "wasp-waist" or "leaf-blade" curvature. The Mainz variety came into use on the frontier in the early empire. It kept the curvature, but shortened and widened the blade and made the point triangular. At home, the less battle-effective Pompeii version came into use. It eliminated the curvature, lengthened the blade, and diminished the point. The Fulham was a compromise, with straight edges and a long point. Gladius Hispaniensis: Used from around 216 BC until 20 BC. Blade length ~60 68 cm (24 27 in). Sword length ~75 85 cm (30 33 in). Sword width ~5 cm (2.0 in). This was the largest and heaviest of the gladii. Earliest and longest blade of the gladii, pronounced leaf-shape compared to the other forms. Max weight ~1 kg (2.2 lb) for the largest versions, most likely a standard example would weigh ~900 g (2.0 lb) (wooden hilt). 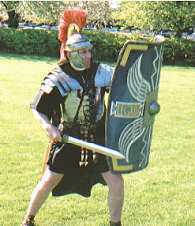 Mainz Gladius: Mainz was founded as the Roman permanent camp of Moguntiacum probably in 13 BC. This large camp provided a population base for the growing city around it. Sword manufacture probably began in the camp and was continued in the city; for example, Gaius Gentilius Victor, a veteran of Legio XXII, used his discharge bonus on retirement to set up a business as a negotiator gladiarius, a manufacturer and dealer of arms. Swords made at Mainz were sold extensively to the north. The Mainz variety is characterized by a slight waist running the length of the blade and a long point. Blade length ~50 55 cm (20 22 in). Sword length ~65 70 cm (26 28 in). Blade width ~7 cm (2.8 in). Sword weight ~800 g (1.8 lb) (wooden hilt). Fulham Gladius or Mainz-Fulham Gladius: The sword that gave the name to the type was dredged from the Thames near Fulham, and must therefore date to after the Roman occupation of Britain began — after the invasion of Aulus Plautius in 43 AD. Romans used it until the end of the same century. It is considered the conjunction point between Mainz and Pompei. Some consider it an evolution or the same as the Mainz type. The blade is slightly narrower than the Mainz variety. The main difference is the triangular tip. Blade length ~50 55 cm (20 22 in). Sword length ~65 70 cm (26 28 in). Blade width ~6 cm (2.4 in). Sword weight ~700 g (1.5 lb) (wooden hilt). Pompeii gladius (or Pompeianus or Pompei): Named by modern historians after the Roman town of Pompeii, this gladius was by far the most popular one. Four instances of the sword type were found in Pompeii, with others turning up elsewhere. The sword has parallel cutting edges and a triangular tip. This is the shortest of the gladii. It is often confused with the spatha, which was a longer, slashing weapon used initially by mounted auxilia. Over the years, the Pompeii got longer, and these later versions are called as semi-spathas. Blade length ~45 50 cm (18 20 in). Sword length ~60 65 cm (24 26 in). Blade width ~5 cm (2.0 in). Sword weight ~700 g (1.5 lb) (wooden hilt). The Mainz and the Pompeii are the two main classification types and served side by side for many years and it was not uncommon to find 4th century legionaries carrying the earlier model.